Lewmar’s often-imitated OneTouch winch handle. You can insert or remove it with only one hand. When we learned how to sail and were fortunate to sail on boats large enough to have winches, the winch handle selection was either some beat up Racelite Southcoast bronze handle with a wooden grip or, if you were really lucky, a Barient chrome over bronze handle with a plastic grip. The selection was modest but the cost of losing a handle over the side was still high! There is a bewildering selection of winch handles today, made from new materials like carbon fiber and plastic, with exotic grips and colors. 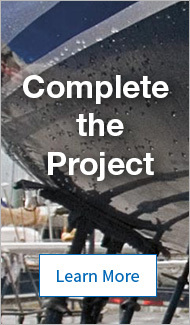 How do you decide which is the best for your boat? Lost any handles overboard lately? Titan handles float! Anodized aluminum: Lightweight, less expensive and less durable than bronze or stainless. OK for all uses; lube lock–in frequently to prevent binding. Chrome–plated bronze: Heavy, expensive, durable. You'll never wear it out and salt water will take forever to hurt it. OK for all uses. Stainless: Heavy, but durable and corrosion proof. An excellent material for handles on cruising boats. Usually very expensive. Reinforced Plastic: Extremely light (they float! ), and they won't damage decks if accidentally dropped. They are quite flexible in the hands of a muscular crewman, but we get back very few that have broken. Carbon Fiber: Extremely light, beautifully finished, and strong. The ultimate racing handle. Recommended for skippers with deep pockets. Makes it much less likely that a winch handle will pop up and go over the side, but is slower to insert and remove. We recommend lock–in handles for all applications. 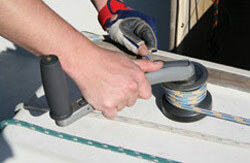 Never leave a handle in a winch when it is unattended; good practice demands that you remove it. shortly after the sail has been trimmed. Non–locking: Referred to sometimes as "standard", these handles fit into the socket, but have no locking lever or release button–they just lift (or fall out), and are easy to remove with one hand. Locking: Most handles use a lever at their winch end. You twist the knob to remove the handle. OneTouch: The newest evolution in design (we wish WE had thought of this), new handles have a patented release button that runs the whole length of the handle. To release the handle, just squeeze and pull in one easy motion. To insert, simply squeeze the handle as you place it in the winch. Single grip: Compact, good for uses where maximum power is not required. Double grip: Allow much more power (40%) to be applied to the winch, especially if you can position your body over the top of the winch. Grip height limits some applications due to interference with dodgers, lifelines. 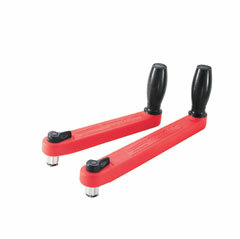 We highly recommend that you have at least one double grip handle. Speed grip, Power Grip, Palm Grip: Each manufacturer uses their own name, but these grips have a knob on top. 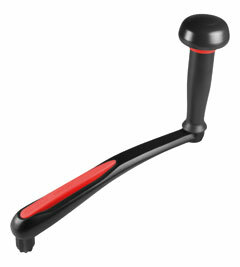 This allows the palm of the hand to be placed on top of the handle. Comfortable, powerful. In general, handles are 10" long, a good size for human physiology as well as the cockpits of sailboats. However, your arms will describe a pretty large circle, and many sailors find they are much faster with an 8" double grip lock–in handle, especially when tacking in light airs. 8–inch: Fast, but low powered. Good with limited clearance. 10–inch: Slower than 8", but 25% more powerful.